A PBS Great American Read Top 100 Pick! The first novel in the beloved Tales of the City series, Armistead Maupin’s best-selling San Francisco saga, soon to return to television as a Netflix original series once again starring Laura Linney and Olympia Dukakis. The second novel in the beloved Tales of the City series, Armistead Maupin’s best-selling San Francisco saga, soon to return to television as a Netflix original series once again starring Laura Linney and Olympia Dukakis. The tenants of 28 Barbary Lane have fled their cozy nest for adventures far afield. Mary Ann Singleton finds love at sea with a forgetful stranger, Mona Ramsey discovers her doppelgänger in a desert whorehouse, and Michael Tolliver bumps into his favorite gynecologist in a Mexican bar. Meanwhile, their venerable landlady takes the biggest journey of all—without ever leaving home. The third novel in the beloved Tales of the City series, Armistead Maupin’s best-selling San Francisco saga, soon to return to television as a Netflix original series once again starring Laura Linney and Olympia Dukakis. The fourth novel in the beloved Tales of the City series, Armistead Maupin’s best-selling San Francisco saga, soon to return to television as a Netflix original series once again starring Laura Linney and Olympia Dukakis. The fifth novel in the beloved Tales of the City series, Armistead Maupin’s best-selling San Francisco saga, soon to return to television as a Netflix original series once again starring Laura Linney and Olympia Dukakis. Tranquillity reigns in the ancient redwood forest until a women-only music festival sets up camp downriver from an all-male retreat for the ruling class. Among those entangled in the ensuing mayhem are a lovesick nurseryman, a panic-stricken philanderer, and the world’s most beautiful fat woman. Significant Others is Armistead Maupin’s cunningly observed meditation on marriage, friendship, and sexual nostalgia. The sixth novel in the beloved Tales of the City series, Armistead Maupin’s best-selling San Francisco saga, soon to return to television as a Netflix original series once again starring Laura Linney and Olympia Dukakis. The seventh novel in the beloved Tales of the City series, Armistead Maupin’s best-selling San Francisco saga, soon to return to television as a Netflix original series once again starring Laura Linney and Olympia Dukakis. Nearly two decades after ending his groundbreaking Tales of the City saga of San Francisco life, Armistead Maupin revisits his all-too-human hero Michael Tolliver—the fifty-five-year-old sweet-spirited gardener and survivor of the plague that took so many of his friends and lovers—for a single day at once mundane and extraordinary... and filled with the everyday miracles of living. The eighth novel in the beloved Tales of the City series, Armistead Maupin’s best-selling San Francisco saga, soon to return to television as a Netflix original series once again starring Laura Linney and Olympia Dukakis. Following the success of his New York Times bestseller Michael Tolliver Lives, Armistead Maupin’s Mary Ann in Autumn is a touching portrait of friendship, family, and fresh starts, as the City by the Bay welcomes back Mary Ann Singleton, the beloved Tales of the City heroine who started it all. A new chapter begins in the lives of both Mary Ann and Michael “Mouse” Tolliver when she returns to San Francisco to rejoin her oldest friend after years in New York City… the reunion that fans of Maupin’s beloved Tales of the City series have been awaiting for years. Maybe the Moon, Armistead Maupin's first novel departing from his bestselling Tales of the City series, is the audaciously original chronicle of Cadence Roth -- Hollywood actress, singer, iconoclast and former Guiness Book record holder as the world's shortest woman. All of 31 inches tall, Cady is a true survivor in a town where -- as she says -- "you can die of encouragement." Her early starring role as a lovable elf in an immensely popular American film proved a major disappointment, since moviegoers never saw the face behind the stifling rubber suit she was required to wear. Now, after a decade of hollow promises from the Industry, she is reduced to performing at birthday parties and bat mitzvahs as she waits for the miracle that will finally make her a star. 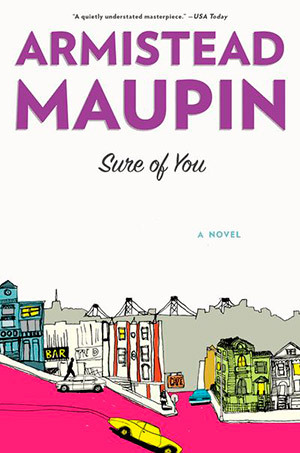 In a series of mordantly funny journal entries, Maupin tracks his spunky heroine across the saffron-hazed wasteland of Los Angeles -- from her all-too-infrequent meetings with agents and studio moguls to her regular harrowing encounters with small children, large dogs and human ignorance. Then one day a lanky piano player saunters into Cady's life, unleashing heady new emotions, and she finds herself going for broke, shooting the moon with a scheme so harebrained and daring that it just might succeed. Her accomplice in the venture is her best friend, Jeff, a gay waiter who sees Cady's struggle for visibility as a natural extension of his own war against the Hollywood Closet. As clear-eyed as it is charming, Maybe the Moon is a modern parable about the mythology of the movies and the toll it exacts from it participants on both sides of the screen. It is a work that speaks to the resilience of the human spirit from a perspective rarely found in literature.